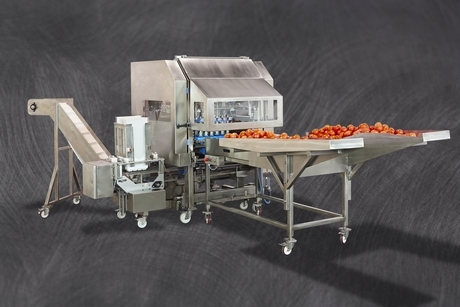 A leading United Kingdom packaging company says demand for its tomato slicing machine is growing, as the need for convenience food grows. Baltimore Innovations now has more than 40 machines world-wide, mostly in the United States and Europe – but also in Japan and Australia. Managing Director Matthew Valentine says they range from hand-held machines that will do 3.5 trays per minute, right up to much larger machines that can handle 144 tomatoes per minute - depending on the customer's specifications. "We are getting more enquiries from countries where there is a growing middle class and there is more demand for convenience foods," he said. "For example, we are starting to get a few more enquiries from the Middle East, and I think a lot of those are linked to the upcoming World Cup. But the reasons the machines were developed were because our customers said they needed a system that saves labour, improves the quality and food safety. But the key point was giving them a reliable system that produced the same package time and time again, and did it cost effectively." Mr Valentine says the feedback from the customers is that the machine pays for itself within six months. "There are lots of machines out there on the market that will slice tomatoes," he said. "But ours is effective because of the speed of output, other machines are only able to slice one at a time. So, they are labour inefficient and output inefficient. We slice at least six tomatoes at a time. Also, our machine, removes the end pieces automatically. In addition, it offers the sharpest possible cut to the tomato, which improves quality, because the sharper you can cut the produce, the better it is, as it removes cell wall damage." Baltimore innovations' primary service is providing absorbent packaging that can double the shelf-life on cut fruit. The UK company partnered with Maxwell Chase Technologies, based in Atlanta around 20 years ago, and began supplying a range of products including: absorbent pads, absorbent pouches (or bags), absorbent food service trays and absorbent retail mini-containers. Mr Valentine says the switch into supplying machinery was to fill a gap in the market, which was experienced by its indirect customers in the fast service restaurants. "We were supplying processors in different countries around the world with the absorbent packaging and they were slicing the tomatoes and then putting it through the distribution chain to be used on the sandwiches and burgers," he added. "We kept hearing the same complaint from the customers that all the machines that were on the market, are all very slow, labour inefficient, or end up mashing up the tomato. They were saying that they were not making any money out of it, and it was difficult to produce a consistent product with what was on the market. The machines being used were designed more to cut ham." So, Baltimore Innovations sat down with their engineers to find a solution, and after eventually bringing something to market, it is now on its 10th generation machine. The Managing Director says the key is to automating the processing and slicing of tomatoes without hand involvement. "The machine has a conveyor where the tomatoes are loaded, and then you have suction cups that pick up the tomatoes that deliver them to a mould," Mr Valentine said. "The tomatoes are sliced, and the end pieces are removed, which can be sent off for other waste or diced add-on products. Then it places the core middle of the sliced tomatoes onto a tray, or conveyor belt. We have flexibility in that we build them around our customers specification, so we have got a number of different models that will deliver into different types of trays." Mr Valentine says it is designed for those customers that have the volumes, who can justify the investment through yield and labour savings. However, he admits that there are some limits to the flexibility. "You set the machine to slice a certain type of tomato, and that can vary between winter and summer, but it will be within a certain specification," Mr Valentine said. "The machine can take either side of that, but what it cannot do is switch from a Roma, to a much bigger beef tomato. The insides are built to do one size and do it well. There have been projects where companies have come to us and wanted to invest in one machine that does 10 different specifications for their 10 different customers. We have had to say we can't do that." 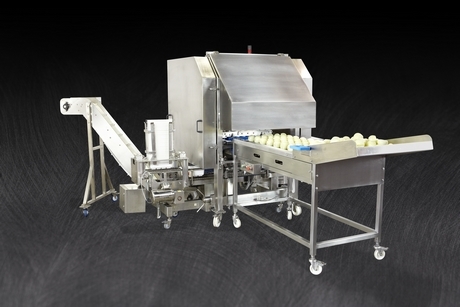 The company has also created an onion slicer, which is primarily used by processors to make onion rings. Mr Valentine explained it stemmed from the tomato slicer, but the motors had to be strengthened to cope with the harder product. "When a customer asked us to modify the tomato slicer to cut onions we originally told him it wasn't possible, but then around two years later we went back and told him we'd now done some tests and beefed up the motors," he said. "So, we built him a machine, and in partnership, we redesigned it to make it suitable for an onion processing facility - and they've now got five machines. It does pretty much the same thing (as the tomato slicer); removes the end, gives the consistent slice thickness - the only difference is it costs more as we have had to make it more robust to handle the onions." Baltimore Innovations say the interest has come from the United States and they have so far not had any sales in Europe, because there is not a demand for the onion rings. "Most people in Europe want either half or quarter moons," Mr Valentine said. "The major onion people in Europe said while it is interesting, they don't have the volume of onion rings. Others have wanted to take the onion after it has been sliced into rings and half it or quarter them. That's not easy to do. All the advantages they will get from this machine, they will negate by adding extra processes. If there is a customer out there who wants onion rings, and a way to save labour and yield and have a more cost-effective product, then we can really help them."